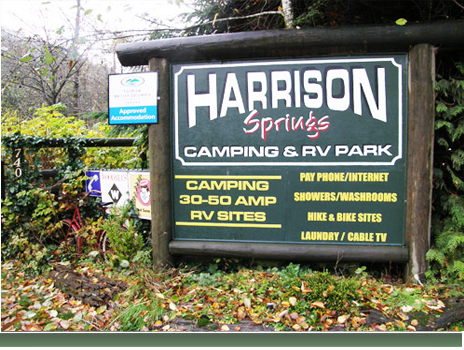 Harrison Spring Camping & RV Park is located East of Vancouver only 90 minutes away, 1 Hour East of Langley, and approximately 50 mins from the USA Border (Sumas). Beautiful Gated Peaceful Campground first one on the left entering the welcome sign.Fully services 30-50 amps for any size motor home, trailer, or 5 wheel.Large grassy natural treed sites, campsites in forested, rustic settings. 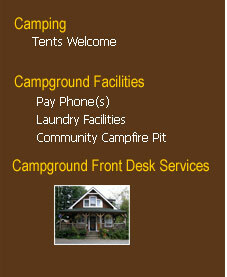 Free showers, 24 hr Washroom, Drinkable water, Ice, etc. 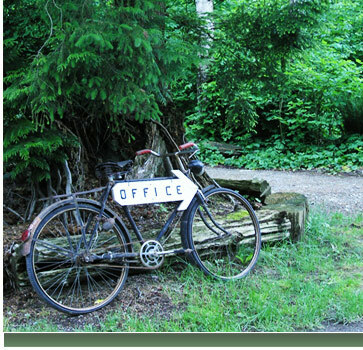 Enjoy full amenities Harrison Spring has to offer. We are within walking distance to town, mineral indoor pool, lake, gourmet restaurants, and pubs. Direction from Vancouver : Use Highway #1 past Chilliwack, take exit 135. Follow the signs to Harrison Hot Springs passing Agassiz. 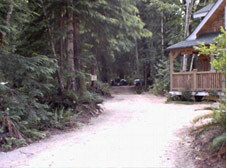 Upon entering the "Welcome Sign" we are on the left side (Approx 300 meters).